Pustak Ka Vivaran : Dor pharar miti jeth sudi 8 sal sanvat 1784 puny udit dharti vai. Jaganathaji samrat ne jo savai Jaypur basayo to neman miti pos badi 1 samvat sal 1784 ne dharti vigha 8 ake ath saphalak kari so vaste dharti ke miti maah sudi 15 samvat 1784 marphat kisanram ki araz pahonchi hukm huva dharti vigha ath dhoyo to maghe vigha 4 savai Jaypur ki bag ke vaste………. 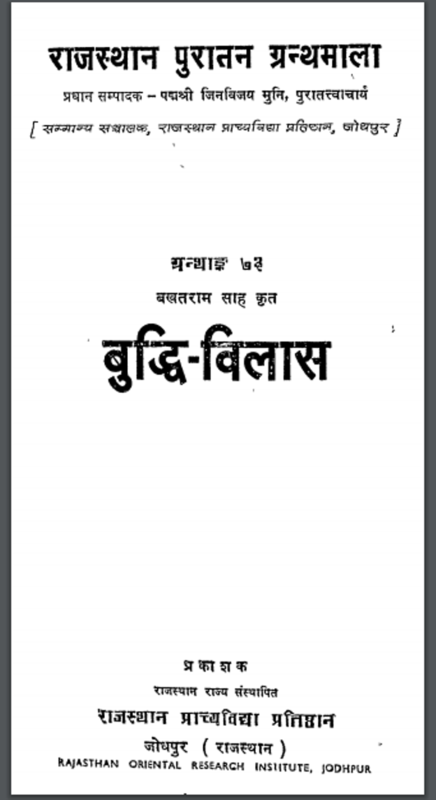 Description about eBook : Door absconding for eight years in the year 1784 Jagannathji Maharaj was born in Sawai Jaipur, then he became the first person in the world, in the year 1784, in the earthly life of eight persons, in the eighteenth year of his death, Jaipur’s Vastate…………….